Oh yes, it’s here…fall is upon us. Okay, I know in many places it may still be (way) too hot for sweatshirts and football hasn’t really started yet, but for many people Labor Day weekend and the arrival of pumpkin spice lattes at Starbucks marks the unofficial start of the season. 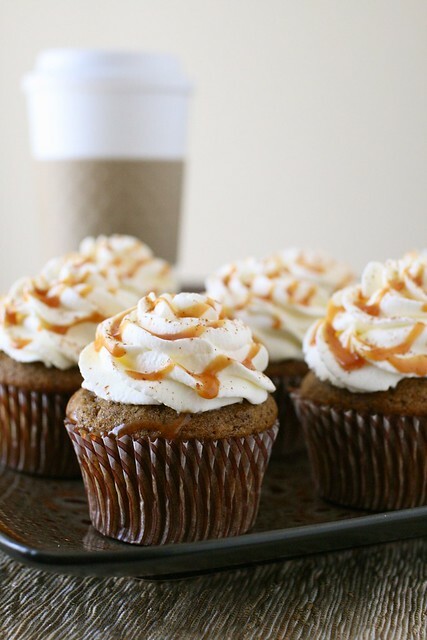 Last year a reader emailed me to ask if I would develop a pumpkin spice latte cupcake and I immediately loved the idea. Unfortunately that was right near the end of the fall transitioning to winter and seasonal beverages were transitioning to peppermint mochas. Since the timing wasn’t quite right I jotted down the idea and went right along with my holiday baking. But the idea has been lurking, never forgotten, just waiting for the season to come around again. The past couple of weeks I have worked on tweaking the recipe to get it just right, and this version fits the bill. I started with a basic pumpkin cupcake but dialed down the spices and added in some espresso powder. After baking, the cupcakes are brushed with coffee to further enhance that flavor. Then they are finished off with lightly sweetened whipped cream, a sprinkle of cinnamon and a drizzle of caramel a la the fancy barista-constructed drinks we know and love. Try them, enjoy them, and welcome fall with open arms. To make the cupcakes, preheat the oven to 350°F. Line cupcake pans with paper liners. In a medium bowl, combine the flour, espresso powder, baking soda, baking powder, cinnamon, nutmeg, cloves and salt. Stir together and set aside. In the bowl of an electric mixer, blend together the pumpkin, granulated sugar, brown sugar and oil. Add the eggs one at a time, beating well after each addition. With the mixture on low speed, add the flour mixture in two additions, mixing just until incorporated. Fill the cupcake liners about three-quarters full. Bake until the cupcakes are golden and a toothpick inserted into the center comes out clean, 18-20 minutes. Transfer the pans to a wire rack and let cool for 10 minutes, then remove the cupcakes from the pans. While the cupcakes are still warm, brush them two or three times with the coffee or espresso, allowing the first coat to soak in before repeating. Let cool completely. To make the frosting, place the heavy cream in the bowl of an electric mixer fitted with the whisk attachment. Whip on medium-low speed at first, gradually increasing to high speed. Blend in the confectioners’ sugar gradually. Whip until stiff peaks form, being careful not to over-beat. Use a pastry bag fitted with a decorative tip to frost the cooled cupcakes. Sprinkle with ground cinnamon and drizzle with caramel sauce. Store in an airtight container and refrigerate.